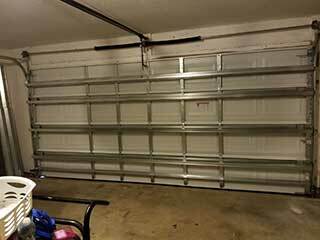 The springs your garage door uses to support its weight are an essential part of the system. Without them, the panels won’t move at all. It’s important to bear in mind that these units will wear out over time, and though they’re built to last they will eventually need to be replaced. It’s essential that homeowners know when spring replacement is required, and why this type of project isn't something they should try to take care of on their own. The service life of your garage door springs will depend on the quality of their build and how well they are being looked after. The longevity of these components is measured in cycles, with a single cycle representing one full opening and closing of the door. Springs tend to last from between three thousand cycles for a cheap extension unit and up to around ten thousand for its durable torsion counterpart. This may sound like a lot, but consider this: an average household uses their door at least twice a day, which comes down to more than seven hundred times every year, and that's the bare minimum. Torsion springs need to be maintained on a regular basis in order to reduce their working strain. They greatly benefit from being regularly lubricated with white lithium grease or a light silicone spray. This allows them to move smoothly and prevents corrosion from setting in. Springs rarely break suddenly. Instead, they usually weaken gradually over the course of several months until they finally fail. If you know what to look for, it’s possible to arrange a replacement before this happens; a door that sags or wobbles as it moves, or one that can’t hold its balance, for example, are two indicators that tension is loosening. If you think spring replacement may be required, do not try and do it yourself; this can be very dangerous, and should only be carried out by trained professionals. For torsion and extension spring replacement, as well as expert maintenance, we’re the team to call. Contact Garage Door Repair Coral Springs today to find out what we can do for you.